Right after I swapped my SuperDrive to second internal HDD I was graving to move my 20 GB Boot Camp partition to the other drive and make it bigger, so that I don’t have to carry another USB disk for my games. UPDATE: From the comments it seems that on Mountain Lion 10.8.2 you do NEED rEFIt for the Windows partition to be visible in Boot Menu. UPDATE 2: I have confirmed lately that the official Boot Camp Assistant method does work on MacBook Pro Retina (Mid 2012) with OS X 10.8.2 (12C3012) on it. So if your Mac came without SuperDrive from the Factory, try the official method first. UPDATE 3: @Jorge_Rui posted excellent step-by-step instructions down in the comments on how he got it working. Take a look. You can skip to Success Story if you are not curious. Also, YMMV, so if my method does not work, you can try one of these and see if you have success with them. First I tried to fake Boot Camp Assistant to create bootable USB stick, but that did not boot for some reason. Also, booting from USB-DVD did not work. Then I used Virtual Box to fully install Windows on physical partition and that did not show up in the boot menu either. With all of these options I also combined rEFIt to no avail. Intel Macs have been using EFI instead of BIOS for booting up the system since the beginning. If Boot Camp dual-booting is not enough for you, there is the rEFIt alternative boot manager that gives you more power over boot options. But it turns out that although rEFIt installs without any complaints, it fails to load from File Vault 2 encrypted partition, which is understandable as I haven’t yet provided my passkey. So, running out of options, I decided to decrypt my partition, which I’d have had to do anyway sometime to be able to resize the encrypted partition over the previous Boot Camp partition (Disk Utility is not able to resize encrypted partitions). I still had rEFIt installed and I retried some of previous failed attempts, including booting from USB, but still no effect. Finally I noticed that I had actually two boot loaders – Mac’s own Option-key triggered menu and then the rEFIt that was installed on the primary Mac OS X partition. While most of the time Mac menu didn’t show me anything besides primary partition and Recovery HD, rEFIt showed me Windows partition (sometimes two of them pointing to the same partition), but was not able to boot from them (giving different errors from EFI failures to Windows complaining that winload.exe is missing or corrupt). In the end I removed rEFIt altogether. OK, enough of the failures. What ended up working was a variant of the Virtual Machine method, that used Virtual Box to make the partition bootable and then copy over the installation files to that partition. Unfortunately I can not find the original post that lead me to the idea, but it was probably somewhere in this thread. Note: At this point I had tried multitude of setups already and I can’t be sure that all of the steps below are necessary nor that all of the required steps are listed. If you find some errors, please comment on them. Create a partition in some way. You can use Boot Camp Assistant to shrink existing HFS+ partition and create a FAT32 partition or you can do it yourself via Disk Utility or diskutil command line tool. I had my partition left over from one of the tries with Boot Camp Assistant and USB DVD-drive. Using Boot Camp for this step has the side effect that it gives you the option to download latest Boot Camp drivers for windows (just have a USB stick ready to store them). Last thing is to actually set up Virtual Box Guest OS. There is nothing special there, except that you specify your * bootcamp.vmdk* as the startup disk, instead of creating new one. Install Windows to the Virtual Box guest as usual. I shut down the Virtual Box client at the “Setting up Windows for first use” step, but according to some posts (links to which I again have misplaced), you could stop even at the first reboot, though it didn’t seem to work in my case. Now you should have a partition that is visible to the Mac Boot menu, but not a working Windows installation. Next step is to restart the install, only this time on the real hardware. To accomplish this, mount the Boot Camp partition, delete everything and copy over all files from the installer ISO (Alo commented below that on his newer Mac Mini he did not need this step, but instead installed rEFIt to boot the new partition). NB! 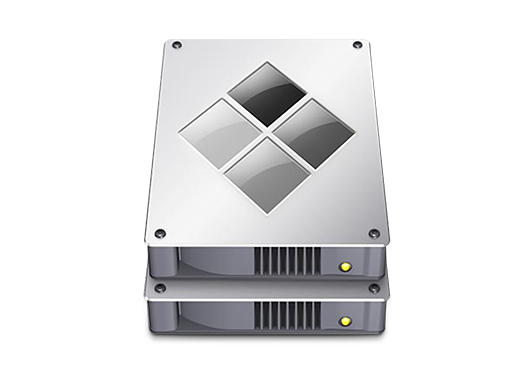 You probably need to have some kind of NTFS driver, either NTFS-3G (see my blog on how to get NTFS-3g working in Lion) or some commercial driver like the Paragon NTFS for Mac OS X I have installed. After you copy over the files, reboot your Mac and hold down Option-key to access the Windows partition. Now install windows as you would if you had with optical disk attached. Thank you so much! Finally a guide that actually works… well kind of. It all works until after the first reboot during the windows installation where it gives me an error saying windows could not update the computer’s boot configuration. Installation cannot proceed. Could it be that you created MBR partition table on the disk, but Windows installer detects that your laptop is actually EFI system and so expects GUID partition table instead? Can’t get it working :(. After I install Win8 with VirtualBox, I clean the harddrive and then I copy everything from the USB to the harddrive. Then I reboot mine Mac, and then I get the (hateful) Winloader.exe error. Do you have rEFIt installed? Comments seem to indicate that it is required, though I had it uninstalled at the time (but quite possibly something remained still that helped me through the process). I’m getting stuck at creating a new virtual machine. Failed to open the hard disk /Users/Tanel/bootcamp.vmdk. The medium ‘/Users/Tanel/bootcamp.vmdk’ can’t be used as the requested device type. If this does not help, then google around – I won't be of any more help there. This seems to indicate that you specified a filename that already exists in that folder. Try with another name. Just tried it today on Mavericks 10.9 and it works great. I have a newer Mac Mini, so I could skip the step where you delete the contents of the bootcamp drive and copy over the install files. I just installed rEFIt, booted from the drive, and finished the Windows Setup I’d started in VirtualBox. Nice! I’ll update my post with this new info. This method still works wilth 10.9.1, Windows 8.1 64 bit and virtual box 4.3.6. I’m trying this on a MacBook Pro Mid 2010 that has a dead Super Drive. I’ve gotten to the point where I reboot after Virtualbox first part of the virtual box install. I’ve tried two different ways: removing all the files that installing under Virtualbox installed and copying the contents of the ISO into the bootcamp partition, and Alo said, and tried to just reboot and try to complete the Virtualbox started install natively. Any way I go about it, I get the missing winload.exe error. Forums suggest that rEFIt might be necessary for the first boot and when native windows install completes, rEFIt is not needed any more. Only other suggestion I can make is to check that you really removed all files and copied all files. There might be some hidden files that you missed. This should make exact copy along with any hidden files, preserving file dates etc. Holy crap, this tutorial actually worked. Thanks a lot guys. I do have to say that there are some skipped steps that caused a lot of headache (for instance, I spent a lot of time looking through VirtualBox’s settings to figure out my ‘no bootable disk’ error — turns out I had to point the CD-ROM boot setting to the Windows ISO, and the commands returned some errors because it wasn’t clear where the bootcamp vmdk drives were being created). With that said, nothing is perfect, and so far this is the ONLY solution I have found to work on an Early 2011 MBP. Hi: I need help 🙂 I been working on installing windows 8 on my Mac. Bootable USB Flash Drive: Type Scan disk 4 GB windows 8 pro iso image but without the driver and the 2nd Scan disk USB flash drive with 32 GB with the Bootcamp Drivers downloaded and saved to this drive. Please Note: I also have the original back up installation disc for Microsoft 8 Prof 64 from Microsoft where I purchased it from. 1st Bootcamp is not recognizing the Original Microsoft 8 Pro backup disk from microsoft itself. 2: Created a bootable usb drive with bootcamp assistant successfully with bootcamp. Yes I close, ejected or un-mounted any image that was open or had been previously used then i restarted the Mac. Next, I start the bootcamp assistant tool once again then i get the same insert your windows installer disc message. 2. On the right you’ll see 5 tab buttons: First Aid | Erase | Partition | RAID | Restore. 6. Click Apply to save the changes and then reboot your Mac and we’ll begin Windows installation. 7. During reboot, press and hold the alt/Option key and you’ll be presented with drives to boot from. 8. Use the arrow keys and return button to select the Windows yellow USB key drive containing your Windows 8 installation files. 9. This will begin the Windows install. –> then i get the following message: “Booting from Boot Camp Assistant created USB Drive…Failed to load BOOTMGR”. 4: Take the Mac to best buy and let them resolve the issue and charge me like a million dollars for it 😥 since i have no other idea who to get this bootcamp working at all. This has been a terribly lengthy issue and it is not as simple as it is claimed to be since i started with the Original Windows Disc Purchased from Microsoft and I have the Optical disc drive which it should be simpler from what I understand. From what I could gather, all your problems seem to stem from your installation media. First thing I would do is check that against another computer, preferably a PC. See if it boots there. All of the steps can be done manually, but w/ BCA it is just easier. If any of the above fails, you have found your problem to work on. You could start with Linux b/c it is generally a lot less picky about its environment than Windows. Then move on to see if your media works somewhere else. I’m running on Mavericks 10.9.2 (Mid 2011 13″ MBP). right when you’re on the first “restart now” phase, eject the iso from virtual box – this should take it into setup and skip the blinking cursor stage. I’m french and i ve test with success solution for my MacBook Pro mid-2010. 1.4 - Remplacer la section "PreUSBBootSupportedModels" par "USBBootSupportedModels"
10 - Supprimer, tous les fichiers et dossier présent sur la partition BootCamp (sauf les dossiers ".Trashes" et ".fseventsd"
20.1 - Supprimer au démarrage avec bcdedit le "DVD"
3) Trouvez celui qui a la description de "l'installation de Windows"
Thank you so much for this post, I definitely wasted a lot of time over a few days trying to get Windows installed before I ran into this post. The first problem I encountered was that windows did not boot from the DVD automatically using Bootcamp. I solved this by holding the alt key during reboot and selecting the EFI Boot. By the way this same method does not work with Windows 7. The third problem I found was that Windows could not finish installation. It had a problem with the updating the boot configuration during the “Finishing Up” part of the install. I was able to solve this by going back to the OSX environment and repairing the permissions on the OSX partition using Disk Utility. From what I read this needs to be done twice. I’m not sure why, but it seemed to work. Additionally, upon restart, I reset the PRAM by hold alt + Command + P + R during start up. On the second start up I held alt and selected the EFI Boot again. This time all installed properly. Unfortunately, I had additional problems with the Bootcamp drivers. Specifically, the graphics drivers. I believe the Intel drivers. My screen was going black and I had to reinstall several time to figure the problem. I had read that the second graphics unit for the mac as issues in Windows 8. I disabled it in device manager. Regarding the drivers, I removed the Intel and Nvidia graphics drivers (for good measure) from my bootcamp install USB. The Bootcamp driver install worked fine even after removing items. Some of this stuff at the end was probably more than needed, but I spent a week on this and wasn’t interested in any more installs. Anyway it all seems stable. I hope this is helpful to others, especially those not as technically sophisticated like myself. Wow, seems you had worst of luck with this. Glad it all works now. Another way I did mine that seems a bit easier was after linking the vmdk file to the physical partition, I fully installed windows on the virtual machine. –Once booted up I just went to C:/Windows/System32/Sysprep. –Open up sysprep.exe and make sure Generalize or OOBE is selected depending on which version of windows you have. –Then set to shutdown on the last dropdown. The system will clean itself of any personal identifiers it has with the virtual machine “hardware”. –The virtual machine will turn off by iself now. –Reboot mac to the Windows partition by using Alt/option on boot. –Windows will reconfigure itself for the hardware it is running on now, which is the physical computer and not the virtual machine. –All set, depending on your mac it could take 15-30 minutes to complete maybe. The installation program need a NTFS partition to be installed but I don’t have on my mac. It seems that the .vmdk in not recognized as a partition. Did you use chmod to allow access to the raw device for your user? Other than that, it’s very hard to offer any suggestions with so little information. I’ve followed Jorge’s directions but it seems that Windows will not start, thus I am unable to install Windows. I must say that I restarted my iMac (Mid 2007) after 5 minutes seemingly doing nothing. Or does it take much longer for it to boot Windows for installation? I don’t think you did not wait long enough. More likely something went wrong. I think I have had similar problem once and just a rinse-and-repeat cycle did the work back then. Do I have to repeat everything or I just have to try to boot again? Of course try just rebooting first, but I’d wager that you’d have to repeat everything from the start (and make a good cleaning in between to undo changes to ensure clean state). Another stupied question: How do you prevent the automatic reboot after the creationn of the Bootcamp partition? I don’t think that it’s possible, as the option to create the partition also starts the installation. One hint: remove all USB/Firwire/etc. devices before booting into the Windows installation. Hey man I just wanted to say great job with that. I thought I was gunna have to go buy a whole new pc for windows cuz my superdrive isnt working and ofc the whole usb thing but all in all this was really sweet. If i may suggest being a little bit more clearer on some of the steps I almost couldnt figureout what to do half the time but I managed to pull through. This is a great way of doing it specially with being able to just reboot straight into the installing phase couldnt have ask for more! Thanks again man, good karma for you!